Kotelnikov, Vladimir Alekseevich (Doctor of Philology; 1947-). Systems. Requirements: 1 GHz PC or higher; RAM 512 MB or higher; Windows OS; Windows Media Player; video adapter; sound card. Access mode: Internet portal of the Presidential Library. 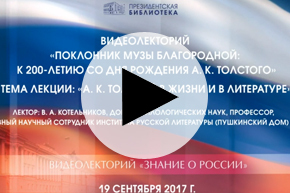 The video lecture is presented within the framework of the educational project of the Presidential Library "Knowledge of Russia Video Lectures". I. Presidential Library (St. Petersburg). Project "Video lecture" Knowledge of Russia ". II. Presidential Library (St. Petersburg) .1. Tolstoy, Alexey Konstantinovich (1817 - 1875) - Biography - Multimedia publications. 2. Tolstoy, Alexey Konstantinovich (1817 - 1875) - - Language and style - Multimedia publications 3. Russian language (collection) 4. Russia in faces (collection) 5. People (collection) 6. Video lectures.